Each week, Voice of Russia hosts Red Line, a discussion about the events of the week, as seen from Moscow. This week, the U.S. downgrade, riots in the UK and Yulia Tymoshenko. Ekaterina Kudashkina: This time we start our weekly program with a look at what’s happening to the American economy and how it could affect the world at large. In our second section, Between the Lines, we look at the street riots in the UK, another difficult challenge for David Cameron’s government. And in our final section, Face in the News, we will look at the drama in Ukraine, where the recent detention of Yulia Tymoshenko has caused an uproar. Let’s have a look at the financial tsunami sweeping the whole world in Beyond the Headlines. In an unprecedented shock to the American establishment, the world’s leading credit rating agency Standard & Poor’s downgraded the United States’ credit rating from AAA to AA+. This is the first time that the United States rating has been downgraded since 1917. Standard & Poor’s assessment came just days after Obama administration narrowly escaped the technical default of the U.S. economy by making a last-minute deal with Republicans in Congress over a debt limit increase. Mira Salganik: While I was watching the bickering between the two parties, I could not get over the feeling that they were discussing not so much the debt ceiling deal, but that pre-election calculations were coloring their discussion. Ekaterina Kudashkina: That is the basic issue. Economic questions are decided in political terms. Sergei Strokan: The White House is now blaming Standard & Poor’s for lack of professionalism and they say it was the Tea Party movement with its “irrelevant moves” in the Congress that provoked the ratings agency to make an erroneous assessment. Mira Salganik: It looks like Americans are following the classic Russian philosophy of asking “Who is to blame?” and “What is to be done?” after the harm has been done! The last few days have seen a dramatic sell-off in shares around the world, with stock markets seeing drops not seen since the crisis of 2008. Sergei Strokan: As a Russian friend based in Washington told me this week, the Americans learned their economy had a rating only after it had lost it. So, I think this is both tragic and funny. It appears majority of Americans hardly knew Standard & Poor’s existed! Ekaterina Kudashkina: Well, now they know. The situation is serious. But like we said, it is a double crisis – there’s a long and slow decline in the United States economy, and there are problems in the eurozone. So, naturally enough investors are nervous, and obviously it is not entirely the fault of the rating agencies. Sergei Strokan: Well, people do not eat ratings. The common man decides what is going on with economy by his salary, his savings, by food and gas prices, etc. So, we will definitely not learn – at least not in the nearest future – whether Standard & Poor’s was right in its assessment, or if it has mishandled the information and distorted the reality as the White House says. My point is this: Let us see how the markets react in coming weeks. Let the dust settle first. Let us see whether the Obama administration can boost the economy, or if Republicans are right when they say that the Standard & Poor’s decision is largely a result of Obama’s failed leadership. Ekaterina Kudashkina: How can they be right? If we are honest, this debt has been building for a decade; a decade ago they had a surplus budget under President Bill Clinton, but anyway, the debate within the American establishment over the questions “Who is to blame?” and “What to do?” is only a part of a global political discussion over where American economy is. Sergei Strokan: This is not only an American debate, this is a global debate, and when we come to the world debate it is obviously not Tea Party’s performance that is debated. I think when we look at the world discussion the core issue is the assessment of what economic pundits call “the Anglo American free market fundamentalism.” Some – not only in America, but in other countries as well – still believe in its basic values and still find this model with all its pitfalls to be the best. Ekaterina Kudashkina: Others argue that it is this model, which has been promoted by America, which has driven the world economy into its present mess. Mira Salganik: And still the core issue of the accusations is that the world’s poor now have to pay high price for America printing dollars to keep its economy afloat, for its huge budget deficit, for overspending, etc. And the anti-American feelings are traditionally strong, as we all know. Ekaterina Kudashkina: It is sometimes quite difficult to draw a line between blunt anti-Americanism and a critical approach based on the notion that the world economy is still heavily focused on America and is based on the almighty dollar as a reserve currency. We do not have any other options. Sergei Strokan: I hope both of you noticed that Vladimir Putin’s recent remark that American economy is a “parasite” got rebukes from American media. But it is not only Putin who says that the world economy needs drastic restructuring and a change in the rules of the game. Soon after the Standard & Poor’s announcement, China called for a new stable global reserve currency, saying that the United States only had itself to blame for its problems. Indians are also calling for change, so this is a global chorus of voices that questions this moral, the way of doing things. Ekaterina Kudashkina: So, what is really happening to the U.S. economy and what are the prospects for future? We discussed it with Iwan Morgan, a professor of U.S. Studies and head of U.S. Programs at the Institute for the Study of the Americas in London. Iwan Morgan: The recent problems that the United States has faced are very significant for the United States at home, but they are also significant for the United States abroad. Certainly America’s failure to deal appropriately and efficiently with its debt limitation problem has done harm to its international credibility. Ten years ago the United States was looked up to as the number one world power –militarily, but also economically. It’s power came from economic influence and power, and now that is in decline, the future belongs to other nations, most obviously China, but also such countries as Brazil, Russia and India. These are the new powerhouses. Iwan Morgan: There is no doubt that uneven distribution of wealth is a big problem in the United States and the only way that many people in the United States have of improving their standard of living is to borrow. We know about the United States public debt habit, but its private debt habit is also very significant and the United States for years has borrowed too much and consumed too much, and that America as a whole – both public and private entities – has not invested sufficiently, it has not produced sufficiently and it has not exported sufficiently. Ekaterina Kudashkina: But 10 years ago there was an economic boom and the U.S. had a surplus budget. Iwan Morgan: That is true. The United States had a surplus budget in the second term of the Clinton administration, it balanced its budget four times in succession; it had not done that since the 1920s. One reason it balanced its budget was that it constrained its spending; military spending was dramatically reduced after the Cold War. But also very significantly, the stock market boom of the late 1990s created massive revenues from capital gains, corporate income taxes and taxes on dividends. When the stock market went down, when we had the dot-com bubble burst in the late 2000 – early 2001, that marked the end of the balanced budget. The Bush military interventions and the Bush tax cuts of the early 21st century insured that the United States would not get back to the kind of fiscal solvency that it had in late 20th century. Ekaterina Kudashkina: Just to sum it up, do you support the point that what we are witnessing now is in fact a crisis of the free market model, or perhaps it is more complicated than that? Iwan Morgan: I think it is more complicated than that. We are facing the situation that the economies of the West are in very considerable trouble and the economies of the East and many of the more vibrant developing nations like Brazil, India, and so on, are not in trouble. It stresses the point to say that it is a crisis of the free market, but I think it is a crisis of the economic dominance of the West. Ekaterina Kudashkina: Is there anything to be done? Ekaterina Kudashkina: And now, I suppose, it’s time to move on to our next section, Between the Lines, in which we usually discuss what we believe to be one of the most notable newspaper stories of the week. This time it’s going to be a column run by The International Herald Tribune on Aug. 10. The piece is written by Richard Sennett, a professor of sociology at the London School of Economics and New York University and Saskia Sassen, a professor of sociology at Columbia. It’s entitled “Cameron’s Broken Windows,” which leaves little doubt as for the subject of discussion – youth riots in the UK. The main reason I suggest we might look at this particular piece is its global perspective. It contains a well-balanced analysis carried out by two experts in sociology who know how to handle the information they were getting. And they bring their vision way beyond the boundaries of the UK. 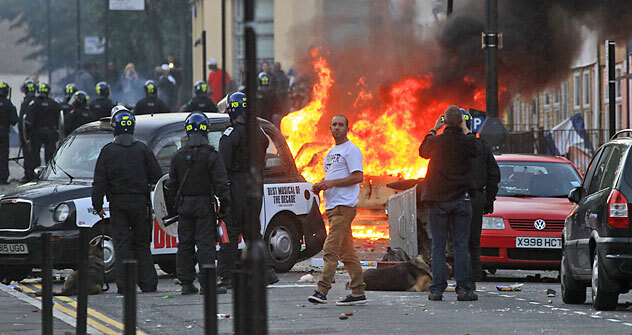 Their main point is that British riots have largely been a result of the government’s austerity program, or social cuts. Mira Salganik: The column says that British riots have been caused by social cuts? Sergei Strokan: But as we all know, there was similar unrest in Britain back in the 1980’s. Sergei Strokan: Does it remind you of the Arab Spring? Ekaterina Kudashkina: To an extent. One of the FT columns has labeled these riots as “the intifada of the underclass.” And yes, it really resembles Tunisia, where it all started after a policeman insulted a jobless university graduate. And it also looks like the riots in Greece this summer. Mira Salganik: To me there is a basic difference in the British riots and in what is known now as the Arab Spring. Number one, the Arab young were motivated, there was a strong political motivation. Secondly, they came from families and they had family values in their minds, while there are many British analysts who stress that the young who are rioting now in London are from broken families, fatherless families. They do not have values, and this is what Cameron has been trying to put across the way I see. It does not apply to the Arab Spring at all. Ekaterina Kudashkina: Well, obviously we are not saying that the developments in the UK or in Greece are same as the Arab Spring. But what we are coming to is that the growing gap between different social groups has caused this trouble, and the growing gap has been in its turn caused by large social cuts. In London, austerity means that there will be about 19 percent less to spend next year on government programs, including education, including healthcare, and the burden will fall particularly on the poor. Before the riots, the government had planned to cut 16,200 police officers across the country. Could that, too, be one of the underlying causes of those riots? This is the question we addressed to our guest speaker - Carolina Bracken, a crime researcher at the Institute for the Study of Civil Society, CIVITAS, in the UK. Carolina Bracken: I think with these riots, what we are seeing at the moment is that really everyone is looking for some kind of cause, for something that motivated them and I think the reality is that actually this is entirely opportunistic behavior. There obviously has been some speculation as to whether any cultural tensions became a cause of the riots, but I think one thing that is very interesting is that the people taking part in these riots come from every kind of race, color, background; there are people of all agesl it is socially indiscriminant. Equally, the people who are not involved in the riots, who are condemning the riots very harshly, also come from all across the spectrum of race, age and gender. I think in these riots in particular it is very interesting to see that there does not seem to be one major thing emerged. Sergei Strokan: I feel what those riots in Britain reveal is that the problem of youth riots is not restricted to the transition of societies. We were inclined just to restrict it to Marxist textbooks, explaining that these are social problems, social revolt, economic problems, but now, Britain is a mature democracy and I think this is a textbook example that this is maybe some new phenomenon of the 21st century. So, this is a product of the information revolution with all its shortcomings. Ekaterina Kudashkina: True. Just imagine what those kids are engaged in: They are sitting in social networks, if you read the chats, if you read the forums, their language is pretty “limited” to some hundreds of words. Do they have an access to huge cultural layers that we have in that country? Sergei Strokan: Definitely, education is a factor, but we should not only restrict it to the educational problem, because there are also ethics and moral values. Mr. Cameron is not just trying to restrict the problem to social issues, he is speaking about the cultural problem, cultural dimension. Kids simply do not know what is good and what is bad, what is good and what is evil. Mira Salganik: I have also read his speech very carefully. Of course, he blamed the spending cuts, but he said that if you look at the root cause, it is that the children were never taught what is good and what is bad, and also he mentioned the culture of violence. This is the first time I have heard a head of state insisting not only on observing the human rights, but insisting on human responsibilities! Ekaterina Kudashkina: Now to our final section, Face in the News. This time we’ll be talking about the Ukrainian opposition leader Yulia Tymoshenko, who has been charged with abusing her authority by signing a gas price deal with Russia back in 2009 when she was still the prime minister. We have talked about Yulia Tymoshenko before, but now she has been jailed, and the decision to arrest her came just days before Ukrainian President Victor Yanukovich met his Russian counterpart Dmitry Medvedev in Sochi. Sergei Strokan: While Yulia Tymoshenko and the summit seem to have no connection, the very nature of the accusations against Yulia Tymoshenko, who is known in Ukraine as the “Gas Princess,” cast a shadow over Russian-Ukrainian relations. Sergei Strokan: It is interesting that sources in the Ukrainian government were quick to explain Russia’s Foreign Ministry statement as Moscow’s reluctance to pave the way for reconsidering the gas deal of 2009, which present Ukrainian authorities stubbornly call “unfair.” In fact, in Sochi, President Yanukovich reiterated his commitment to fight for just reconsidering the deal. Mira Salganik: All right, but it was signed two years ago. And, as you know, Ukraine did not denounce it, it still abided by this deal. What is “fair” and “unfair”? Sergei Strokan: Ukrainian officials claim that Yulia Tymoshenko caused a loss of nearly $200 million to the state budget when she signed a gas deal with Russian Prime Minister Vladimir Putin in early 2009 after a gas dispute with Russia. And now Ukrainian authorities are saying that Russia is to blame for the negative balance in trade with Russia, because the prices for gas are skyrocketing from one month to another. Ekaterina Kudashkina: The detention has caused an unprecedented international reaction. Tymoshenko has for a long time been listed in the world rankings of the most influential women, and the Ukrainian opposition insists that Yulia Tymoshenko has become a subject of a political vendetta. Sergei Strokan: It is enormous news in the West, but as far as the Ukrainian opposition is concerned, they say this is the vendetta on the part of her long-time adversary, President Yanukovich. The Ukrainian opposition is saying that Yanukovich wants to put her in jail simply to sideline her from big politics before parliamentary and presidential elections in the country; parliamentary elections are in 2012 and presidential elections in 2015. If she gets a seven-year term, this covers both the parliamentary and presidential elections. Mira Salganik: No doubt President Yanukovich found it hard to forget that Tymoshenko lost to him only very narrowly in last year’s presidential elections. Moreover, she has a well-deserved reputation and he knows that she is a dangerous enemy. She is labeled as the type that never takes no for an answer. Sergei Strokan: Whatever reasons there might be for the Ukrainian prosecution, the opposition may have a point – President Yanukovich does have a reason to wish she were unable to participate in politics. But to me, the whole scenario of the recent events in Kiev is a universal scenario: a dethroned leader is accused of something that nobody opposed while said leader was in office. And the list of charges is standard: the abuse of power, embezzlement of state funds, corruption. The former leader denies everything, declaring the accusations false and politically charged. What happens after that? Western leaders and human rights activists make a big noise and step into play, expressing their concern, although this hardly changes anything. Mira Salganik: I think we have to remind our audience that Ms. Tymoshenko has been known in Ukraine as the gas princess since the early 1990’s. She was the owner of a company that traded in Russian gas. At that time, nasty and persisting rumors were already circulating in Kiev of stolen gas, avoided taxes, etc. Ekaterina Kudashkina: Meanwhile, as it turns out, year after year, a politician in Ukraine has primarily to adopt his – or her - own position vis-а-vis Russia, and this will be his declaration of intent on which a politician is to be judged by the electorate. And Ukrainian leaders have been known to make dramatic turns in their relations with Russia, depending on what electoral group’s support they see as a priority at the moment. Sergei Strokan: Yulia Tymoshenko was used to view Russia as a threat. I remember the story in Financial Times where she was saying that the key task of Ukrainian politics is to tame Russia. Definitely at that time she was largely seen as anti-Russian in Moscow, then she made a dramatic turnaround and she ended with signing a gas deal with Moscow. And look what happened with President Yanukovich, who initially was considered pro-Russian due to his sugary promises of building eternal friendship with Moscow, now he is accusing Tymoshenko of trading national interests to Russia! Ekaterina Kudashkina: As an incumbent last year, President Yanukovich needed the support of the pro-Russian electorate. Now he’s become president and he is bargaining for “friendly prices” on gas. Sergei Strokan: So, if there is anything that stands to lose as a result of all dramatic twists performed by Ukrainian leaders obviously driven by their own domestic political agendas – it is the relations between Russia and Ukraine. Ekaterina Kudashkina: How are the negotiations on gas between Ukraine and Russia evolving now? This is what we discussed with our next expert - Arkady Moshes, director of the Russian Program at the International Studies Institute in Helsinki, Finland. Arkady Moshes: The only thing that we can say with certainty at the moment is that they will not be easy, because the problem is objectively a difficult one. What is most important is that Moscow feels that it has the upper hand, that Ukraine has very little alternative in terms of diversifying its gas supply and it has very little alternative in terms of using the transportation system that it owns as a trump card in these negotiations, because Russia can build a bypass pipeline. Ekaterina Kudashkina: Do you think that those talks could be somehow influenced by the situation with Ms. Tymoshenko? Ekaterina Kudashkina: How do you see the general picture of relations between Russia and Ukraine developing in the nearest future? Arkady Moshes: First of all, we should see that now practically all observers agree that the honeymoon in Russian-Ukrainian relations is over, that all the hopes that emerged when Mr. Yanukovych was wrongly believed to be a pro-Russian politician have disappeared, and Russian-Ukrainian relations are returning to the well-known road. Ukraine has been drifting away from Russia throughout the whole 20-year-old period of its independence and I am sure that this process will continue. I am also sure that Moscow will not look calmly at the benevolently at this process. So, I am not necessarily predicting a new crisis in this relationship, because psychologically it would be difficult for Russia to explain to its own Russian citizens why it has to have conflict relations with Kiev regardless of whoever is in power, but nevertheless, the atmosphere of this conflict will unfortunately be preserved and prevail.